The weapon cannot be tempered. This issue has been addressed by version 1.0 of the Unofficial Skyrim Patch; it can now be tempered using ectoplasm, and it now benefits from and requires the Dwarven Smithing perk. 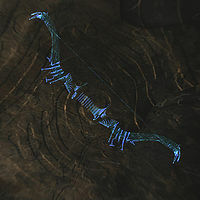 A Drainblood Bow's enchantment is too costly for its charge to allow for more than one use of its enchantment's ability. Its enchantment was most likely supposed to have a similar charge to that of the Drainheart Sword, which can be used 25 times before needing to be recharged.